Update: This messaged was edited 8/29/09 to remove identifying information, for security reasons. Our third day began with another breakfast together with all the brothers in the hotel. This would be our last day with the brothers from Nepal. After breakfast we retreated to our assigned private room (a small bar off the main dining room) and began with worship. We had asked each brother to prepare a short devotional and they had been sharing them throughout the time together. It was good to hear their heart. One interesting thing Patrick did was ask the brothers to tell us which languages they spoke. Between the 12 brothers representing 4 different countries (including Patrick and I) we speak a total of 24 languages! What a blessing! At 10:00AM we were joined by Bro. Thomagujta Lotha who works with several international missions organizations, including DAWN, OC and others. He is from the Nagaland area of India that were once fierce headhunters but who converted almost en masse over 100 years ago and have had a strong missionary mindset ever since. 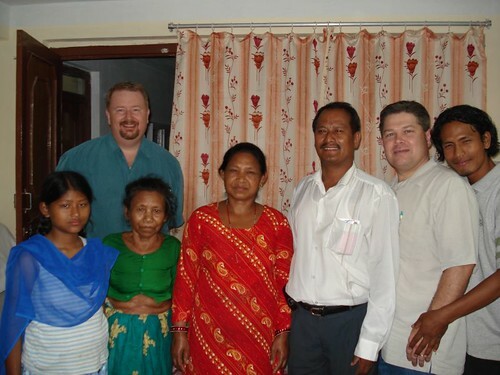 Over 90% of Nagaland residents consider themselves Christians today, 75% are Baptists. Bro. Lotha shared his heart for reaching the nation of Nepal and welcomed the ministry of CSC. He pledged to work with CSC using his contacts to broaden our reach. 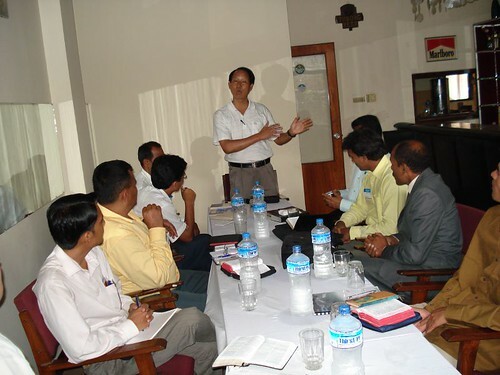 He will be a tremendous resource for us, as hopefully CSC will be for the Nepalese church. My name is [deleted]. I am from a Hindu background of the Rai tribe in Nepal. This is a middle class caste, who worships different ancient cultural gods and goddesses, as well as idols of our own ancestors, lands, stones, rivers, big trees and mountains. I was born and brought up in a very superstitious Hindu family. As a son of Hindu it is the custom and duty to observe and follow the rituals and practices of the parents. If not, they expel them from the society, sometimes they lose their inheritance of the property in a physical sense. In 1972 a German Christian brother, Klaus Peter Kugler, came to live in our village for 4 years to teach the Gospel of God, and to learn our language. It is through his teachings that I came to know the Lord as my Savior 27 years ago. Before I came to know the Lord, my mother was very sick. My father allowed the practice of the traditional healers for a long time, but she was not recovered. I was so sad at that time because I used to think that I would become an orphan if she died. It was then that I heard the Gospel from this German brother. I heard the Gospel from him in the village. I accepted the Lord as my Savior. I found myself as a lost sheep and felt no reputation at all in the society. I realized I was going into the dark pit. The moment I repented for the sins committed in the past my burden was relieved. The Lord gave me new thought, speech and new way to act. I gave up all the old paths and began to walk in newness of life. I prayed for my mother and she was healed. After this I really live with Christ and experience Him in my daily life. I was thrilled and began to share the good news have passion to serve Him. Due to my faith in the Lord and practice my parents kicked me out from my home. I even lost my inheritance. Yet I am serving the Lord with joy and happiness that is more than anything else of this world would find. Then I was arrested for preaching. They found me in my house and bound me cruelly with ropes and began to beat me badly in front of my crying parents and wife. I was taken to the police station. That night a drunken police officer began to beat me very badly. I cried out. A 15 year old believer had followed me as far as the police station and came in to help me. The officer continued to beat me until my scream alerted another neighbor, a non-Christian boy whom I did not know. He came into the police station and tried to take away the stick. In the struggle the stick was broken. When the officer went to get another stick the boy pushed me out of the police station. I escaped barefooted and began running in the night. I felt in my heart to not return to my village but to go to Raxaul, India to a Christian hospital. I walked all through the night – the route was narrow, hilly, forested and filled with wild animals. I found a large root to eat and later found some people who gave me some food. With much difficulty finally I reached Duncan Hospital. Mr. Rishi Raj Acharya was very kind to me and arranged a job and a place to stay. He also helped me get word to my family that I was safe. They were happy because they had heard I was killed by the police and my body was hidden somewhere. After some time my elder brother visited me. He told me that everything was fine now and that i could return home. But now that I had a job I didn't want to go back. My brother prevailed on me, that as the first Christian being persecuted, I had to be an example to other Christian and Hindu villagers. So I decided to return with my brother. For the next two years I was able to preach the Gospel and lead the village church. As more and more villagers believed, the Hindus became angry with us, because their sons and daughters joined us and stopped their Hindu practices. Again they reported to the police, political leaders and District Officers. Many times the police came to arrest other Christians and me. But they did not find me. Our friend goes on to tell of further persecution again him and other Christians in that village. In every persecution the Lord used it as a witness and more believers were added. Finally in 1976 his family was arrested and deported from their native lands to Kathmandu. There he finished high school and attended Bible College. He later returned to his village on the weekends to preach in the village church and started a small house-fellowship Bible study in Kathmandu that grew into Grace Church that he pastors now, along with several other works. What a blessing it is to know such men as these. All of the brothers have a high dedication to sharing the Gospel. All are willing to suffer, indeed, have suffered persecution for the sake of the Gospel. Nepal is less than 2% Christian. But the Christians I've met have impacted me deeply in their steely faith and trust in the Lord. The pastor invited us to him home for supper and we were able to meet some of his family, his wife, a son and daughter and his mother-in-law. He served us a delicious meal and we recorded the greeting above on his rooftop. We are honored that he would desire to partner with CSC and is willing to do the hard work of film evangelism for the sake of souls. His family is serving the Lord with him. His son is seeking to complete his Masters of Theology, desiring to be a greater help to his father's ministry. After supper we headed back to the hotel to meet with the Pakistani brothers and go over the CSC Training Manual with them as they had not been here when we went through it with the Nepalese brothers. We asked them to forgive us for not being able to go to Pakistan this trip and explained how we had not had a peace about going. We apologized for not telling them that earlier and for the inconvenience of them having to travel to Nepal. Babar said on behalf of both of them that they would be willing to travel anywhere in the world to partner with CSC so that they could receive the equipment and training to reach their people. They have such a passion for the lost souls of Pakistan and even of Afghanistan!!! They are fearless in their desire to serve God and win souls! Lord, grant us more such workers. And help us to imitate them in our service to You! Nathan Flickr account. Most of these were taken on our drive to the pastor's house and from his rooftop.